​I'm really excited to share this excellent contribution from my friend Alee who spends her time helping women ditch the 9-5 and make money from their blogs. It's the dream! Alee has done some really great work and she shares some of her insights in this post. You don't want to miss this one. Alee, tell us how to become a full time blogger! Since I was practically a child, I have always wanted to become a writer. I'd heard of bloggers, of course. But it almost seemed like a mythical tale that you could actually become a full-time blogger and work from home. And the thing is, I never believed it would be possible for me. It wasn’t until about 7 months ago that I started my research and began to see just how possible it is to generate income from a blog. In fact, I realized that the earning potential is pretty much limitless for bloggers since it's so easy to branch out into many different monetization strategies. Not too long ago, I was reading various income ﻿reports from bloggers earning up to $100,000 per month who've only been blogging for a few short years. You can click here to read Eden's income reports. Learning that people can earn so much money blogging was mind blowing to me, but it gave me hope. For the first time in years, I felt like - why the heck can’t I quit my job and become a full-time blogger, too? In two short months, I have grown my traffic exceedingly. I have new subscribers on a daily basis, and I’ve actually started to pull in an income with my passion. For me, this is worth more than any amount of money. Not only that, but I have started a freelance writing business. So, between my blog and my freelance business, my plan is to be making a full-time income by the end of 2017. Although, by the looks of it, it won’t take me nearly that long, which is unbelievable to me... it's really happening! Throughout this journey, I have realized that my true passion is to help other ambitious women and moms take the leap into working from home. Because I now know, firsthand - it is possible. If you’re tired of building someone else’s empire and are ready to take the leap and blog full-time, read on, my friend. 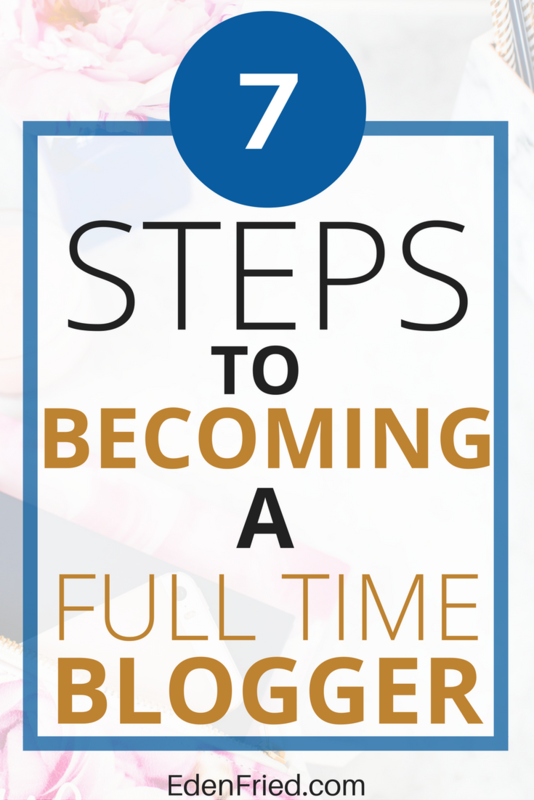 Here are 7 steps you can take to become a full time blogger. Creating a plan is the most crucial step you’ll take in your blogging journey. Since productivity can become quite challenging when you’re working from home every day, it is vital to have a stellar plan in place. The sooner you start looking at your blog as a business the better. Because, truly, it is a business the second you make a dime. You don’t have to go all out and create an extensive business plan, but it also wouldn’t be the worst idea in the world. What is my blog really about? What's my niche? How much money do I need to quit my day job? What are my blogging goals on a weekly, monthly, yearly basis? And, most importantly, what's my strategy to monetize my blog? This will go a long ways in helping you narrow down a plan of action for your blog, and decide what streams of income you’re going to be focusing on. Finding your blog’s focus (or ‘’niche’’) is another biggie. If you’re unsure what exactly you want to write about it, make a list. Write down some topics that you are truly passionate about. And I mean really passionate about. This is critical because you’ll be writing about this topic for some time. As tempting as it may be to choose a broad niche, I would suggest thinking twice about that one. Not only will having a particular niche or focus for your blog help narrow down who you are blogging for, but it makes it easier to monetize it down the road. What is my target audience struggling with and how can I help solve that issue? Is this a topic I can write about for a very long period of time? The point is, you’re reading this because you want to quit your job and become a full-time blogger; which means, you want to be a successful blogger. And in order to be a successful blogger, it is imperative that you hone in on a focus. I don’t believe that you ‘’must’’ have a niche. 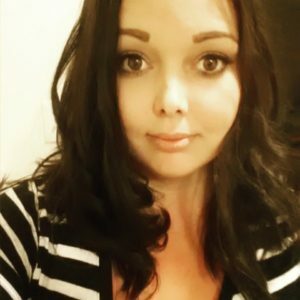 (Kate From Layered Indu﻿lgence is doing more than alright for herself, and she doesn’t have an exact niche - but she does have a focus and target audience). I do believe that establishing your focus is one of the most critical things you can do for your blog. Here's why a targeted niche is important - imagine this scenario. You’re doing wonderfully with affiliate marketing and sponsored posts, but you want to take your blog and it’s income to the next level. So you decide to create and sell your own digital products. You certainly must know who you’re marketing these products to. If your niche is broad, you will have quite the variation within your target audience, which could make it nearly impossible to sell your fantastic ecourse that you just spent 6 months creating. Well this may seem like the obvious first step, it’s actually not. It’s essential that you have a plan in place and a focus or niche before you take the leap and actually start your blog. You may already have a blog, or maybe you’ve been debating starting one for months.. or even years? No worries! It’s never too late. If you're not quite sure how to start a blog, Eden's got you covered so check out her 15 minute setup guide. 1. You will need to decide on a blogging platform first of all. I recommend WordPress (the self-hosted version). Especially if you’re serious about blogging and want to make a full-time income. 3. Next, you will need to purchase web hosting if you’re going with a self-hosted WordPress blog (which I certainly hope you are). 4. Finally, install your blogging platform. Starting a blog can seem very intimidating. But I assure you, it’s easy-peasy once you get the hang of it. I had no previous experience and found it fairly straightforward. Boy, that’s a mouthful. But it’s a very important mouthful. There’s loads of controversy over how long a blog post should be, but considering that the top 10 positions on Google for many keywords is content that contains at least 2,000 words - I would say long-form content ranks much better. They also give your readers more value, as generally when we have a problem we are looking to solve, we’d prefer an in-depth article that fully explains it - rather than a 300-word post that only scratches the surface. Yes, this will take more time. Which is why I would say it’s perfectly fine to post once or twice a week. And I think it goes without saying quality posts are a must. Spend your time perfecting your post before you hit that ‘’publish’’ button. This is something I attempted even before I started my blog. That’s right. It is possible to develop your online presence much before you launch your blog (though that's not to say you can't start your blog without an online presence). First of all, social media. I opened accounts for my blog/biz on Twitter, Instagram, Pinterest, Facebook, and Linkedin. This is an incredibly smart move you can make for your blog, I have found out - because you can establish yourself in the blogging world well before you even launch your blog. Which means, you will likely have an array of followers eager to read your blog before it’s even created! Talk about awesome! Next, start commenting on popular blogs. This will ensure your name gets out there. Just make sure you sign up for Gravatar so your picture shows up when you comment. This is something I neglected for quite some time, and in hindsight, I think this would have helped develop my online presence even more, if I would have made this simple change from day one. Not only will this expose you to a new audience, it will build relationships with other bloggers. You’ll also likely receive new readers in the process, win-win. If I haven’t convinced you yet, guest posting on other blogs will also help build your credibility and can go a long ways to building your authority in the blogging world. It gets your name and your blog out there in cyberspace, so why the heck wouldn’t you do it? If you’re planning on quitting your job to become a full-time blogger, you’re clearly going to have to make some money! So, how do you make money blogging, you ask? Well, there are several routes you can take. Some are better options than others. · Affiliate Marketing. This is a passive income source and you can be quite successful with it. This is when you post links in your blog posts or on social media, and you get paid when someone clicks the link and purchases something through one of those links. Affiliate marketing works for any niche too. · Advertisements. This is when you place ads on your website, and you can get paid by views and clicks. This is not something I would recommend unless you have a gigantic amount of traffic. Many readers will find ads off-putting as well. · Sponsorships. Blog sponsorships are when you put advertisements on your website and get paid for it. This can be sponsored posts, reviews, or many different things. · Creating Digital Products (Your own products). Creating your own products is by far the best way to monetize your blog. This includes creating and selling courses, e-books, or other digital products. Creating your own products is definitely where it’s at! · Offering services. Offering your own services through your blog is another outstanding way to monetize your blog. The options are endless. You could be become a freelance writer (like me! ), a proofreader, virtual assistant, coach, graphic designer, web developer - and the list goes on. Get more in depth monetization strategies to start earning money from your blog quicker. Now, it can take time for your blog to really flourish, but there are plenty of things you can do to get the ball rolling. First of all, let’s talk social media. We’ve already touched on this subject, but in order for your blog to thrive, you must network and connect with other bloggers and online entrepreneurs. This includes guest posting, commenting on other blogs, participating in Facebook groups for bloggers, and engaging with people in your own community. I would suggest getting business cards done, that way when you run into someone and mention what you do for a living - you can hand them a professional business card instead of scrambling to find a piece of paper to jot it down on. Building your email list will be the most beneficial thing you do for your blog or biz. Well it’s fabulous to be popular on Instagram, you don’t own anything! So those 10 thousand followers you spent years getting, they don’t mean anything in the long run. But, it’s true. If Instagram or Facebook were to go bye-bye, like Myspace did so many years ago - what would you be left with? Notta! With an email list, you own the right to those email addresses, and these are the people who really want to hear from you. These are the people that will purchase your fabulous e-products you launch. So don’t hesitate, start building that list from day one. A quick way to do this is to offer some killer opt-in freebies. And I would suggest getting a plugin like SumoMe or OptinMonster (if you’re with self-hosted WordPress, which you should be!) I use SumoMe for pop-ups and it has gotten me way more subscribers than any other form on my blog. Learning to become a full time blogger doesn’t have to be difficult or scary. I didn’t have a bloody clue what I was doing (and still don’t sometimes), but I was able to start my own blog and begin making money in my first month blogging! And it’s totally possible for you, too. While I still have a long ways to go, I’m ecstatic with my blog’s progress and can't wait to see the results in a few more months. Don’t let your fears hold you back like I did for so many years. Take the leap, and follow your dreams! Become a full time blogger! It will be the best decision you ever made. Alee King is a freelance writer and blogger over at www.thebeautifiedlife.com. She helps moms and ambitious women start profitable blogs and grow their biz so they can ditch the 9-5 for good. When she's not blogging or copywriting, she enjoys curling up on the couch with her rambunctious toddler and adorable kitten. 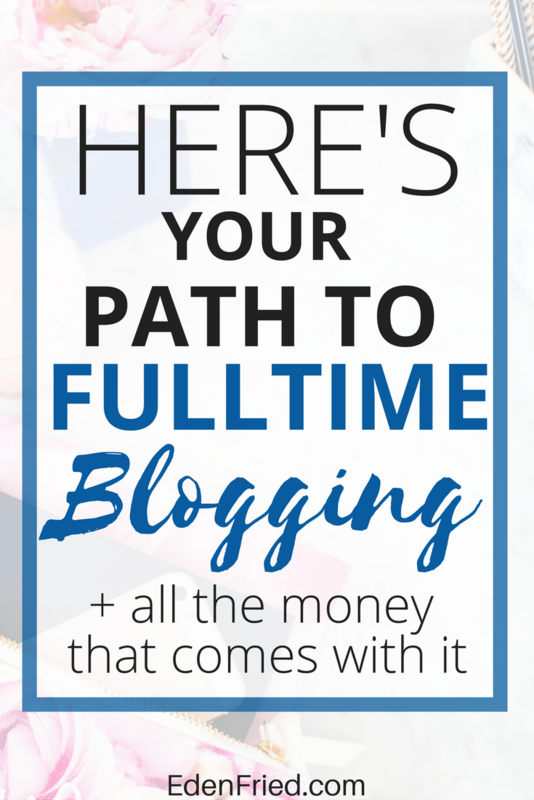 I would just LOVE it if you would consider pinning this image to spread the love on Alee's incredible contribution on how to become a full time blogger!